If the engine oil is clean and the VVT and OCV circuits are OK, replaced the VVT to resolve the problem. When is the code detected? After the ECM sends the target duty cycle signal to the OCV, the ECM monitors the OCV current to establish an actual duty cycle. The ECM determines the existence of a malfunction and sets the DTC when the actual duty cycle ratio varies from the target duty cycle ratio. The Engine Control Module (ECM) controls the Oil Control Valve (OCV) to regulate the intake camshaft angle. As a result of the angle change, the engine timing is advance or retard. Optimizing engine timing will help the engine improve torque and fuel economy, and the exhaust emissions decrease under overall driving conditions. The Variable Valve Timing (VVT) system includes the Oil Control Valve (OCV) and VVT controller. The ECM detects the actual intake valve timing using signals from the camshaft and crankshaft position sensors, and performs feedback control. Help us improve AutoCodes.com. Leave a comment below or tell us if the information above help you fix the code. 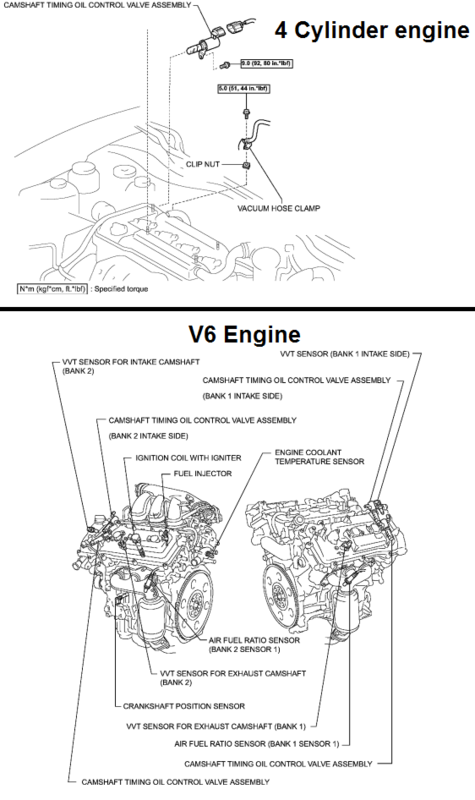 What are the symptoms on your vehicle for the P0010 2010 Toyota Camry code? Have you replaced any parts?